Let’s deal it this way, dentists are disliked by kids and grownups in the equal breath and are often highlighted as ruthless professionals. We don’t mean a dentist themselves; but the attention towards the profession by whole. People often find their dental appointments painful and are often reluctant to go to a dentist for simple procedures such as cleaning, dental fillings, etc. Usually kids are known to possess lots anguish for dentists and dental clinics, but they are also the ones who can be easily cajoled to love their dental visits. Over the years dentists have been handling out small and beautiful custom gifts at the end of visits such as hockey plastic ring or dental shaped toys, etc. However, dentists have grown up to the realization that in pursuit of cajoling they are forgetting the actual brand building. This is why many of them are now relying on dentist and orthodontist magnets, which can keep the kids enchanted, and elders glued to their dental commitments. Remind an appointment – This is very important given to the fact that kids and parents are reluctant to remember a painful appointment with dentist. 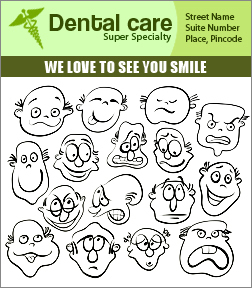 Magnetic dental appointment cards and dental magnetic memo cards can do the trick. Wipe-on-wipe-off magnetic memo cards are very interesting because they not only help to remember an appointment, but also offer lot of conversational space too. Offer interesting Indulgences – As said before kids are easily susceptible for cajoling and they will definitely remember an appointment if offered some interesting and indulging toys such as tooth shaped magnets ( bearing contact information) and color-me magnets. Dentists can leap a step ahead and try to keep both kids and adults tippy- toed by offering them tear off magnetic calendars. 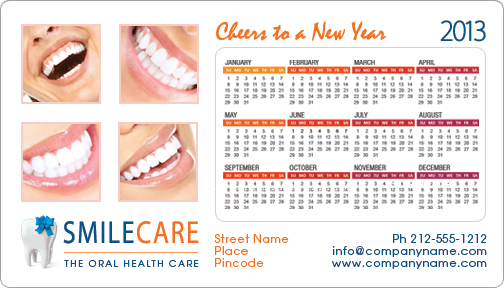 An indulgent dental calendar magnet will remain over the refrigerator door and remind viewers about their next dental appointment or as simple as dates and days in month. In a way these interesting magnetic calendars offer high visibility against investment. Easily Reachable and Caring– Dentists need to work hard to generate this feeling of easily reachable by finding a place over bland refrigerator doors found in kitchens. For this they can easily depend on large array of dental fridge magnets involving unique choices such as dental business cards, and specialty business cards. Apart from regular contact information dentists can try out some indulging gimmicks such as interesting quotes “ We care for your smiles” to hold a viewers interest. It is for sure that after indulging or trying out some unique dental and orthodontist magnets mentioned above, dentists need not feel sorry for themselves in 2013.